Join Moondance for a relaxing sunset paddle in Bellingham Bay. Perfect for people of all experience levels as we travel in stable tandem sea kayaks enjoying the sunset over Whatcom County and Bellingham Bay. This trip is all about enjoying the moment as we bid the day farewell from the comfort of our kayaks. Meet group, guide and hand out safety equipment (beginners welcome as always). Discuss kayak safety, paddling techniques and the evenings route. On the water – soak it in as the daylight fades and the calm pace of your paddle brushes the edge of the Salish Sea. Feel free to bring snacks and enjoy a floating picnic while peacefully saying goodbye to the setting sun over Bellingham Bay. Arrive back at boat launch, return safety gear and help load boats. Thanks for joining and so long for now! Book now or view our calendar here! Sunset Paddles times vary – check out our calendar to see which times work best for you or request a custom trip! Age Requirements: Generally we suggest 7 years or older, but please keep in mind that sunset times do vary and some paddles may go as late as 10:00pm. Please feel free to contact us about setting up a family adventure that would meet your needs! Bioluminescence Paddle times and dates vary depending on the moon phase. Come join us for a Bioluminescence Paddle in Bellingham Bay! Generally we do these trips by request during a new moon phase. The less light on the outside world provides a better opportunity for us to see these glowing wonders in the water. You will learn about these magical living organisms while having the opportunity to paddle Bellingham Bay at night. All trips include a guided instruction and are great for beginners and experienced paddlers alike! You can expect a total of 3 hours with your guide with almost 2 hours of on water paddling. *Route will vary depending on weather. Kayak orientation and paddle technique instruction on land. On the water! Enjoy paddling during dusk as you wait for the darkness to come. 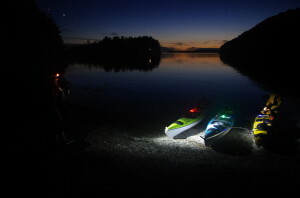 Paddle dark nooks and crannies to look for bioluminescence under our paddles. Back to the beach, de-issue gear and load up, time to say good-bye for now! Thanks for joining and we hope to see you again! Age Requirement: Although these trips are great for families, we suggest 13 years of age or older for our Bioluminescence tours. These paddles tend to take place later at night and find that younger folks get worn out too quickly to have an enjoyable experience. If you would like to set up a “private family trip” we would be happy to discuss what would work best for your group. Thank you in advance for your understanding. Please refer to our FAQ’S page for more information.